Francis turbine is a type of hydraulic turbine which is used to convert hydraulic energy of water into mechanical energy. This mechanical energy is further used for different purpose like electricity generation. Francis turbine is a type of reaction turbine i.e. here pressure is not remain same throughout the turbine. Francis turbine is named on James B. Francis. He developed inward radial flow reaction turbine called as Francis turbine. Later on some modification was made on it then it is called as modern Francis turbine. In modern Francis turbine water enters into the turbine runner radially and leaves axially through its center. Due to this reason sometime it is known as mixed flow reaction turbine. Francis turbine works on medium head and medium discharge i.e. it works on 30-600 meter head. Now a day’s Francis turbine is the most commonly used turbine because of its working conditions. The casing of this turbine should be air tight because pressure varies continuously throughout the runner. At the entrance of the turbine pressure is much higher than the pressure at exit. When water starts flow through the runner the pressure energy start converting into kinetic energy. This turbine use both kinetic energy and pressure energy for working i.e. Francis turbine requires both reaction force and impulse force for power generation. 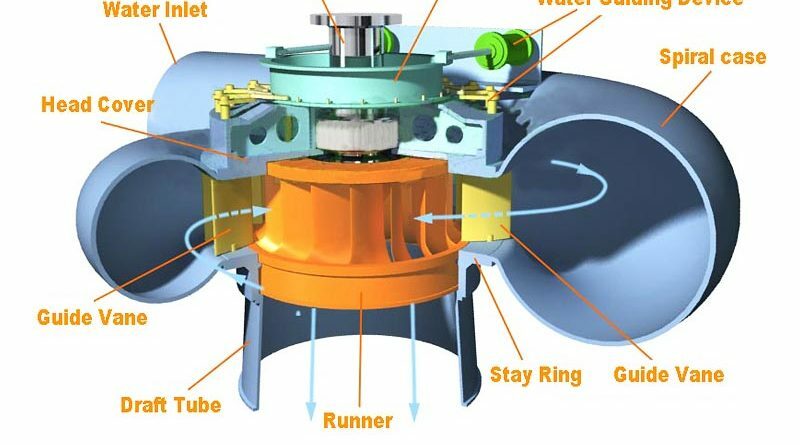 Construction of Francis turbine is quite complicated, it has various components which should be arranged in proper manner and should be manufactured with high accuracy. 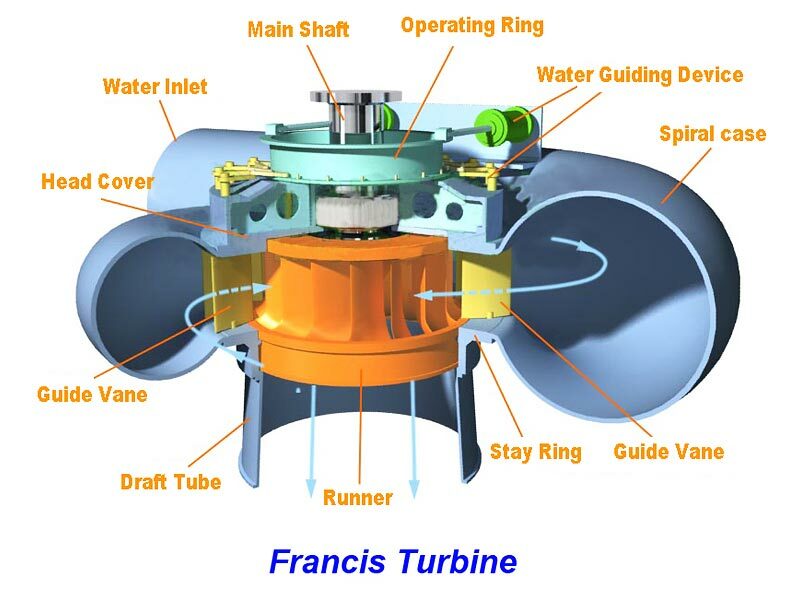 Following are the main components of Francis turbine. PENSTOCK: Penstock transfer water from reservoir to the turbine. It is a large diameter pipe, generally made up of concrete or cast steel. SPIRAL CASING: Spiral casing has uniformly decreasing cross sectional area. Casing is made up of cast steel, plate steel or concrete depending upon the requirement and working condition of the turbine. The main purpose of casing is to provide constant velocity of water at the inlet of the runner. The main reason of decreasing cross sectional area circumferentially to maintain constant velocity of water throughout the runner and helps in maintain a uniform pressure. At the end water strikes to the runner blade with uniform velocity and pressure. FIXED VANES AND GUIDE VANES: The main function of fixed vanes and guide vanes is to convert pressure energy into kinetic energy. Fixed vanes always remains stationary at their position and helps in distributing of load due to internal pressure energy of the water. Fixed vanes increase the efficiency of the turbine. They are generally made up of cast iron, cast steel or sometimes fabricated steel as per requirements. Guide vanes used to guide the water towards the runner in a fixed guide vane angle direction. After passing through fixed vanes water guides by the guide vane before entering into runner. Guide vanes are fixed but rotate about their own axis i.e. they can change their angle for the flow of water according to the load and working conditions. RUNNER: The runner of the Francis turbine is made up of cast iron, cast steel and stainless steel. Shape of the runner decides the flow of water through the turbine. Francis turbine has two cases, in first one simple Francis turbine i.e. it has inward radial flow type runner and in second case mixed flow Francis turbine or modern Francis turbine. It has mixed flow i.e. water enters into the runner radially and leaves axially. The runner of the Francis turbine consists of series of curved vanes mounted circumferentially in the angular space between two plates. When water changes its direction from radial to axial in case of modern Francis turbine then it produces a circumferential force on runner which rotates the runner. The runner is attached with shaft which is further attached to generator for power production. DRAFT TUBE: Draft tube is mounted at the exit of the runner. Water comes out through runner goes to tail race through draft tube. Draft tube is a gradually increasing cross section area which join runner exit to tail race. It is made up of cast steel or concrete as per requirements. Draft tube must be air tight that’s why its end should be into the tail race and must be submerged below the level of water in the tail race. The main purpose of draft tube is to convert velocity energy rejected from the runner into the pressure energy and second main function of draft tube is to make a suction head at the runner exit. In short we can say that a draft tube is used to convert kinetic energy into pressure energy in order to increase the efficiency of the turbine. It is the major component of the Francis turbine. Working of Francis turbine quite complicated. Water enters into the turbine through penstock then enters into the spiral casing. The cross sectional area of casing decrease circumferentially to maintain constant velocity of water. After casing water enters into the runner, here water first strikes to fixed blades then guide vanes. Fixed vanes convert the head available with water partially into dynamic head. The casing of the Francis turbine should be air tight and always filled with water. Fixed vanes remove swirls from the water and make linear flow of the water. Swirls generates due to the spiral casing. After that water strikes to guide vanes which are stationary at their place but revolves around their own axis. Guide vanes decides the proper angle at which water strikes to the runner blades and control the flow rate of water into the runner. The guide vanes are controlled by means of wheel in case of small units or by using some automatically operated governor in case of larger units. When load is increases the flow rate of water increases by means of guide vanes and as the load decreases, flow rate automatically decreases. All these components are designed to lead the water into the runner with minimum loss of energy. The runner of Francis turbine have series of curved vanes, these vanes are designed so that water enters into the runner radially and leaves it in axial direction in case of modern Francis turbine but in case of old version simple Francis turbine water in and out both in radially. This depends on the construction of the runner. This change in the direction of runner from radial to axial produces a circumferential force on the runner and runner starts rotating and output is taken by joining shaft with runner. Shaft is coupled with the runner which is used for power transmission. With the help of shaft power is transferred to the generator which is used for generation of electricity. Francis turbine can be operated for different head this is the main advantage of this turbine and due to this Francis turbine has various applications. It is most commonly used turbine in hydro power plant for electricity generation. Mixed flow reaction turbine has some other applications in irrigation purposes like pump the water from the ground and many more. It is the most efficient turbine these days, so it can be used for different purposes for power generation by using hydraulic energy of water. This is all about francis turbine construction working and application. If you have any query regarding article, ask by commenting. If you like this article, don’t forget to share it on social networks. Subscribe our website for more informative articles. Thanks for reading it. ← What is Venturimeter? How it Works? Can you make same notes of pelton turbine and kaplan turbine?